The Scent Of Christmas Is In The Air! Candles are essential this time of year for creating a warm and inviting atmosphere in our homes. They also make excellent gifts and at Strawbridge we now have a special range of Irish made scented candles in a beautiful variety of scents and colours. At the moment we love our seasonal fragrances of Nutmeg and Ginger, Cinnamon and Clove and Frankincense and Myrrh. Light these in your hallway to instantly fill your home with the inviting smells of Christmas! A lovely idea is to line your staircase with candles on either side of the step. Our Irish made Duffy & Scott scented tea lights would be perfect for this. They come in a range of scents and are ideal if you just want a light fragrance in the air. You could also put your scented tea lights inside little candle lanterns and just use a few at a time. This would keep the flame safely enclosed as well as look beautiful too. At Strawbridge we have a number of beautiful candle lanterns and candles to choose from. Visit our showrooms to see our collection, click here for our location details. Our scented tea lights come in a set of nine and are €6.50 for a set. Our Pillar Candles are € 14.90 ea and come in the scents; Black Orchid, Nutmeg & Ginger, Cinnamon & Clove, Cedarwood and Woodland Walk. We will have seasonally appropriate scents available in the Duffy & Scott range throughout the year in our showrooms. Click here for information on how to find our showrooms. View our Pinterest page where we share inspirational ideas and for selected image sourcing. These scented candles encased in glass jars complete with a lid would make a lovely gift. The lid is perfect for when you wish to store your candle and there are lots of fragrances to choose from! They are €19 each and come in; Black Orchid, Nutmeg & Ginger, Cinnamon & Clove, Cedarwood, Woodland Walk and Frankincense & Myrrh. The classic pillar candle is always an elegant choice and as well scented candles we also have a wide range of unscented plain pillar candles. 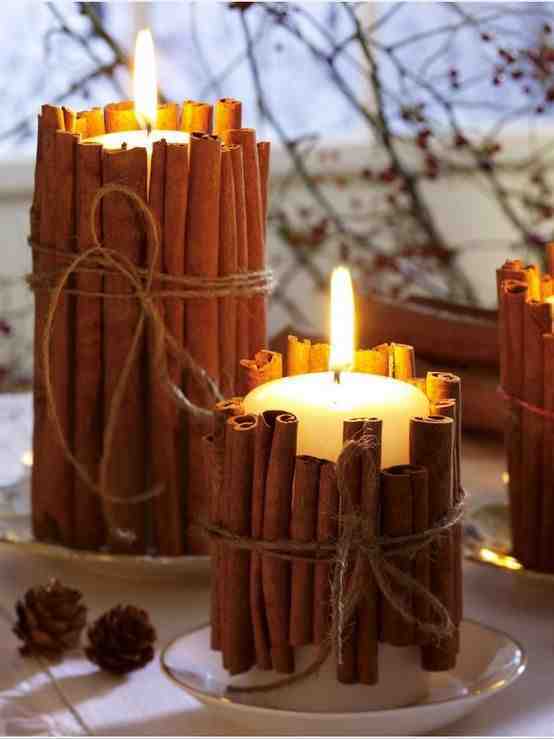 If you like the idea of scented candles at Christmas but not at any other time of year then a great idea is to take an unscented pillar candle and tie sticks of cinnamon around it with twine. This way when you light the candle the scent of the cinnamon is released and then you can just untie it when you are happy with the way your room smells!